The understanding and improvement of the human living environment have been major goals of individuals, researchers, communities and governments. The overall assessment of humans’ living environment has been commonly expressed by the term quality of life across multiple disciplines. An understanding quality of life has tremendous potential implications because improving quality of life is a major policy and sustainability goal. In order to obtain the comprehensive understanding about quality of life and sustainable development aspect, recently, several global institutions used a number of standard tools to measure aspects of environmental quality in relation to quality of life. The main purpose of the quality of life measurement is providing tangible information about what is needed for the accomplishment of a good life, value of humankind, how strong human bonds are and the relationship to the environment. As one of the prominent developing countries, Indonesia sought to expand the availability of data regarding regarding quality of life and environmental quality to support improvements on sustainable development. 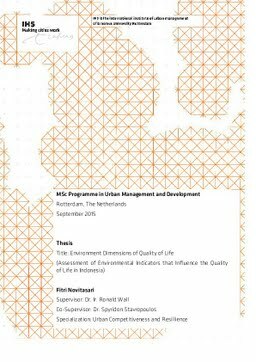 Therefore, this research measure the relationship between environmental quality dimensions and quality of life in Indonesia during 2010 to 2013. There are three major environmental quality dimensions that have been used for this research, which are: environmentally responsible behaviour, physical environmental quality, and consumption of environmental services. The objective quality of life dimensions are established from good health condition and life expectancy at birth. Meanwhile, there are also several control variable derived from demographic and social dimensions.